Today I’m delighted to welcome Neil White to the blog. My first ever guest post! 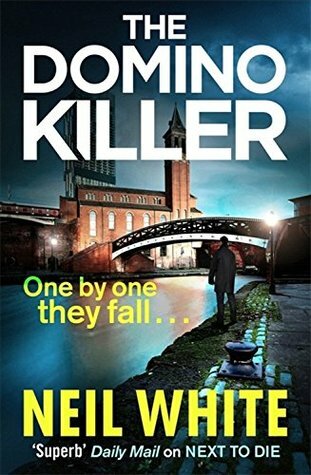 Neil’s new book, The Domino Killer is out in July in hardback (thanks to NetGalley for the advance review copy!). He’s here to talk about plotting, but let’s talk books first. When a man is found beaten to death in a local Manchester park, Detective Constable Sam Parker is one of the investigating officers. Sam swiftly identifies the victim, but what at first looks like an open and shut case quickly starts to unravel when he realises that the victim’s fingerprints were found on a knife at another crime scene, a month earlier. Meanwhile, Sam’s brother, Joe – a criminal defence lawyer in the city – comes face to face with a man whose very presence sends shockwaves through his life. Joe must confront the demons of his past as he struggles to come to terms with the darkness that this man represents. It’s a gripping tale, neatly plotted and oozing authenticity. Two brothers, one a lawyer, one a policeman, both drawn into the investigation of their sister’s murder many years earlier. Secrets and lies, twists and turns abound as the case unfolds. It’s the third book in his Parker Brothers trilogy. Plotting – a tangled weaving road, laced with potholes. Plotting is one of the hardest parts of writing a book, because whatever is written in those early days can determine whether the book will be a success or not. A bad idea, or a good idea? It is hard to say then, it’s too early, but the idea takes shape there, jotted down with a pen and paper. For me, learning to plot was part of the very long and steady learning curve. A necessary curve, but long nonetheless. I started writing in 1994, the product of a few years of talking about it and then an idle moment when on holiday in Fuerteventura. ‘I’ll be a lawyer until I can be a writer’ was just some daft thing I’d say. I decided to test out my theory. How hard could it be? It’s only writing words, after all. At first there were four pages of A4 in scruffy handwriting, and then there was a small typewriter with a tiny screen that only showed six lines at a time. Floppy disks saved the slow development of my opus, my creation, worked at in my bedroom where I lodged with my boss. I printed it off occasionally, so that I could marvel at how much I’d written. Then came the crash. I sat down and read it. Let’s just say that it wasn’t very good. Worse than that, I didn’t really know what it was about and what was going to happen. Looking back, I can’t remember the plot or even the characters, which perhaps says a lot about something I worked on for around three years. I knew what the problem was: there was no direction, no coherence. I needed to plot. I sat down and tried to come up with ideas, until I came up with a story about a serial killer in Boston, Massachussetts who was killing people who shared the name of Salem witches. His obsession with the Salem witches was because his wife killed herself out of a belief that she was a descendant of a Salem witch due to the coincidence of name, and that it had somehow caused her to be possessed by evil. It didn’t matter whether the plot was any good. The point was there was a plot, and that was all that mattered. So I started to sketch it out. A paragraph became a one-page summary, which turned into more pages, and I spent a few months fleshing it out, adding to it, putting in phrases I liked. The beginning, middle and end became more pronounced and chapters started to appear, the plot thinning out into strands, and then broken down into scenes. Eventually, it was a 10,000-word monster, a blow-by-blow summary of the book. What helped was a documentary I saw about Steven Spielberg, who has a very meticulous way of setting out his storyboard, where he allocates a certain amount of time to each scene and will not deviate from it, regardless of how well the filming is going. In his view, his storyboard is balanced, and any deviation upsets the balance. I looked at the summary again and tried to follow Spielberg’s method. After all, he’d done okay with it. I looked at each scene and thought of its importance or complexity, and then allocated a certain number of words to each one, intending to reach a total of around 120,000 words. That helped enormously with the plotting and then the writing. If a scene was pivotal, it would have to be a long one, but that is too long for a fast-moving crime novel. So I found a way of splicing it with smaller scenes, which kept the focus shifting. Once I set out on actually writing it, working to a word count gave me discipline. If a less important scene ended up with too many words in it, I cut some out. If a major scene needed more words, I had to find some more. I didn’t follow the plot outline religiously, I’m not as disciplined as Spielberg, but the outline gave me a route map, and if I deviated from it, with a new idea or angle, I knew where the plot had to return to, as if it allowed me to take the occasional scenic route. That finished plot ended up as a self-published book, Salem, which got me an agent, who eventually got me a publishing deal. It resurfaced, in a much re-worked format (and a different location, with Lancashire replacing Boston) in my third book, Last Rites. My only regret with Salem is that I didn’t pay for an editor; there are some grammatical howlers in there. Now, I plot less. Not because I don’t need to, but just because I don’t have time. I set out the basics of an idea, try and get a notion of how it ends, and a few major points along the way, before I sit down with a pad and pen and sketch out the first fifteen scenes or so. I know I need to plot the next part when I get stuck, so I sit down with a bottle of wine and try to work out the next stage. Some writers spend months planning and then blitz it. I can’t do that. I panic about not leaving myself enough time. So I start and plot as I go. The hardest part is the middle, because I’ve arrived at a certain point but need to work out how to get to the end, and hopefully provide excitement along the way. Sometimes joining the end to the middle can seem impossible, but in the end it happens.